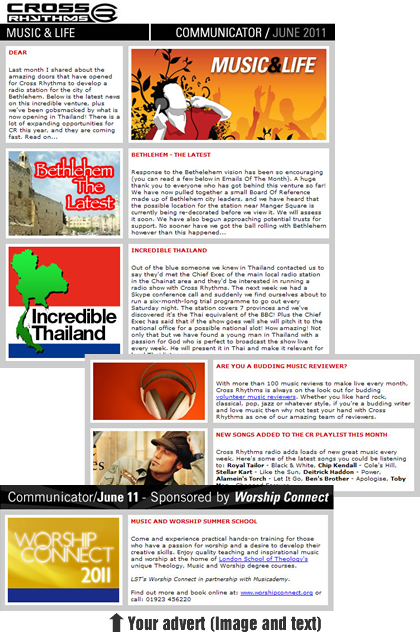 Cross Rhythms sends a monthly email newsletter to over 28,000 people called the Communicator. This email is available to sponsor. We only accept one sponsor per email and there are no adverts! The Communicator gives information about what's happening at Cross Rhythms and about our sponsor. The cost is £15 per 1000 emails. Discounts are available if in conjunction with website advertising. Each sponsor gets 40-60 words for the main message, 5 words for the header, as many links within the story as are needed and an image. If you are interested, please register your interest.